How can you ensure you reach your full potential? 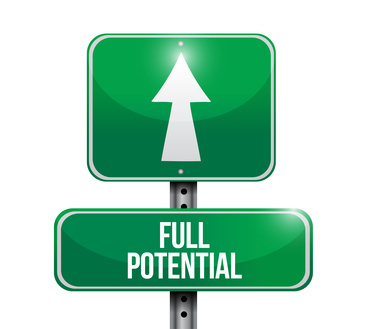 How do you know when you have reached that full potential? How to you encourage and allow your team-members to reach their full potential? The most common trap is fear. I’ve never met a 20 year old or a 50 year old who says, “I’ve never had a single passion, dream, hope or desire.” We all have them, but a lot of us give in to fear as soon as we get close to them. The reason is that fear only gets loud when you do things that matter. Fear never bothers you if you’re average but the second you dare to be more than ordinary, fear awakens. The trouble with many of the development programs in companies is that they work on the basis of performance appraisals and assessed developmental needs. Performance appraisals are made by individuals with their own views and biases and usually take into account current performance against current or targeted company, department or team goals. Although most companies do career planning and succession planning it fails to adequately capture your full potential if it stays on the narrow path of current performance, estimated potential as measured by individuals above you and achieved goals. Larger companies have a tendency to actually fall into the trap of the Peter Principle or Dilbert principle, both resulting in the promotion of people to the highest levels of companies and being incompetent at those positions. Let me be clear, there is a need for the traditional paper-flow towards the end of the year with talent reviews, performance appraisals, career development, estimated personal potential assessment and so more but also be realistic, none of these tools got Bill Gates, Steve Jobs or Warren Buffett to where they ended up. To reach your full potential you will need to work at it yourself and have an internal drive to get there. Many people plan from the perspective of who they want to be and get frustrated by the lack of progress and lack of accomplishment. Try starting from who you are rather than from who you want to be. If you start running you don’t want to mirror the training schedule from a Kenyan runner when you are a former couch potato. Realize who you are, what your unique position is and work from that basis on your personal unique path. Don’t be afraid of the “man behind the curtain”. Be brave, know that whatever will come of it, you will have the satisfaction that you have tried it and even if it goes horribly wrong, you won’t have to ponder the rest of your life how it would have been if you had acted or, even worse, blame yourself the remainder of your life for missed opportunities. Ask help, no athlete has ever become a World champion or Olympic champion without a coach, so why should you? Developing a plan, charting out a career path or development track, it all helps to get to your full potential. Opportunities come and go, reaching your full potential is more a factor of following a process than acting on this particular opportunity right now. Some athletes will forego an opportunity to compete in the world-cup to be better prepared for the Olympics. However you decide, ensure you plan ahead and follow the path so you don’t get distracted by the occasional setbacks and stumbling blocks. Once you have reached a certain level, you will be able to see the next step more clearly. Well that just starts the process again, keep working at it and keep learning as you go along. The question is if you ever reach your full potential. If there ever comes a time that you have reached the level beyond which you won’t ever go. The judge is you. You are the only one who can assess if there is more or something different you can explore. Skills may very well be transferable and you may have developed to your full potential in one area only to discover that there is another adjacent area where you could grow into. It only stops when you are satisfied that it can stop now. Not because you are worried about what lies beyond the horizon or around the next bend but because you feel you have reached that comfortable level that you can look back and genuinely say that you have given it your all and have satisfied all the need for exploration and growth you had. Tagged motivation, performance, potential, process. Bookmark the permalink.